Small-plate eating is as popular as ever, and Penn Quarter is ground zero for this trend. How do I figure that? Because it's home to the Jose Andres' small-plate triple-play of Jaleo, his original Spanish restaurant, Mexican Oyamel and Mediterranean-leaning Zaytinya. Among José Andrés' mid-priced Penn Quarter restaurants, Zaytinya is frequently regarded as the best. It has a higher Zagat rating than Jaleo or Oyamel and frequently places (usually along with Jaleo) on lists of D.C.'s best restaurants (it's strange to me that Oyamel is often the odd one out of this trio, as it's probably my favorite of the three). I've written about Jaleo and Oyamel in the past. Although I'd been for lunch before, it was only recently that I enjoyed my first dinner at Zaytinya. Chris's niece, who is vegan, was visiting and it seemed like a good choice. Zaytinya's vegetable-heavy menu, showcasing a range of Mediterranean influences, easily satisfies vegans and meat-eaters. We started the evening with a couple of spreads. 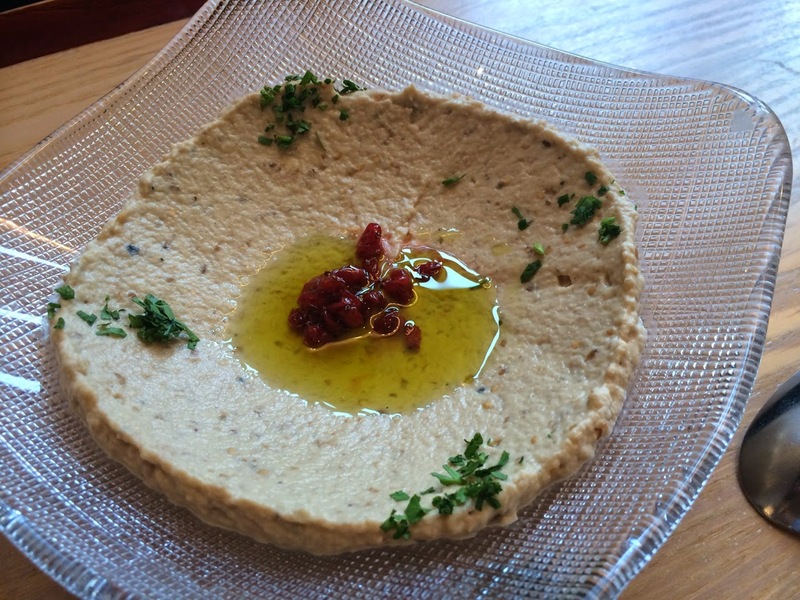 Zaytinya's hummus is perfectly decent, smooth and flavorful. But the smoky baba ganoush, made with fire-roasted eggplant and dotted with pomegranate seeds, is what really commanded our attention. 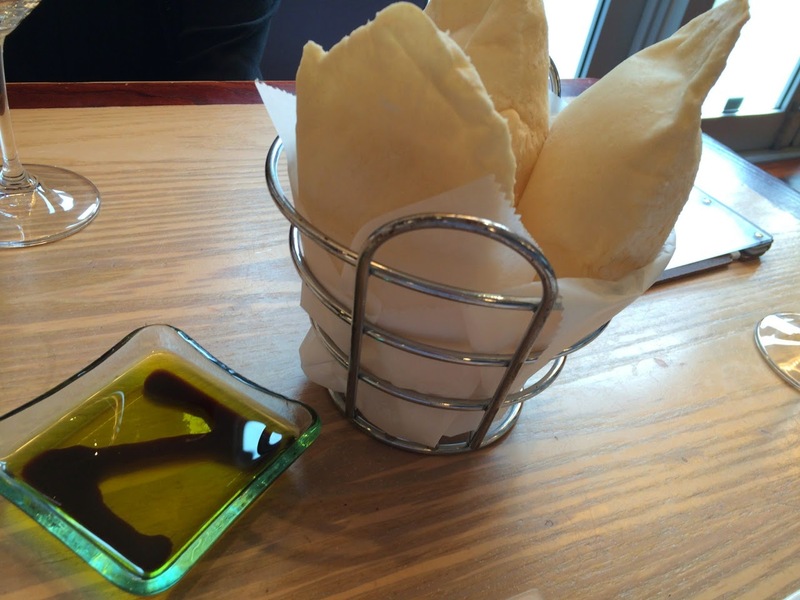 Accompanying the spreads are Zaytinya's puffy warm house-baked pitas. Don't be shy about asking for more. Next we turned to a trio of fresh salads. 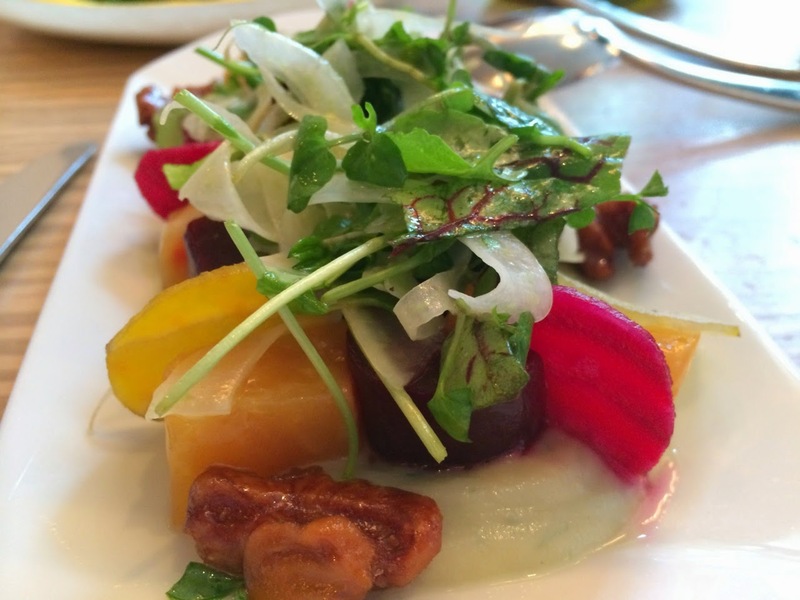 My favorite was the flavorful mix of colored beets with shaved fennel, water cress and candied spiced walnuts. We also enjoyed the kale salad. 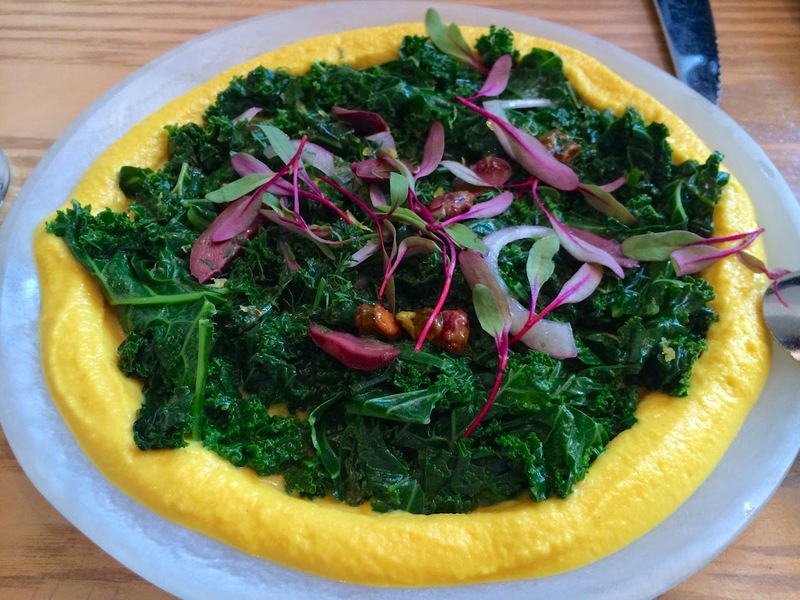 The kale leaves were quite tender, as if slightly cooked, and came generously garnished with fava Santorini, a Greek yellow-pea puree. A few pistachios provide crunch. I was excited to try the fattoush, since I'd recently been reading about the Middle Eastern salad similar to Italian panzanella. 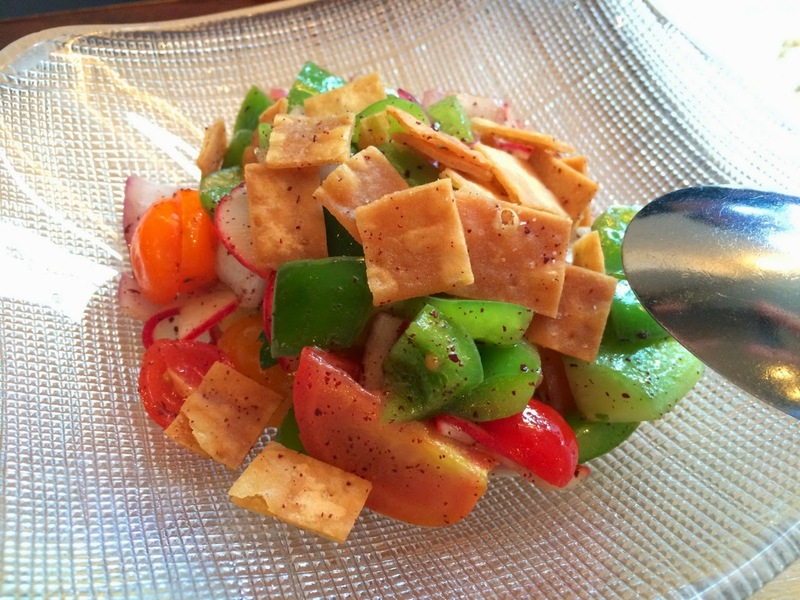 The salad of tomatoes, cucumber, green peppers and red onions was probably the least exciting we tried, although I enjoyed the crunch of the fried pita chips. 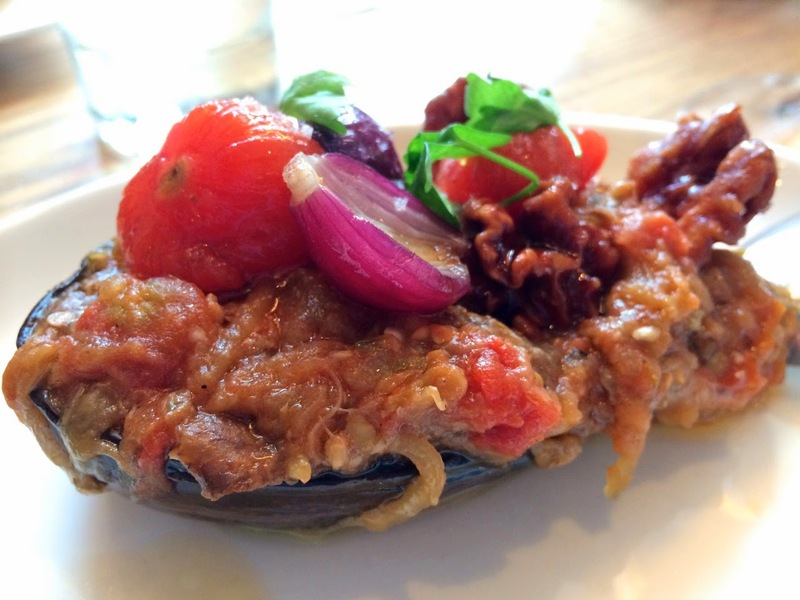 The vegetable mezze provided some of the evening's most enjoyable dishes, particularly the Ímam Bayildi, roasted eggplant stuffed with tomato, onion and walnuts. 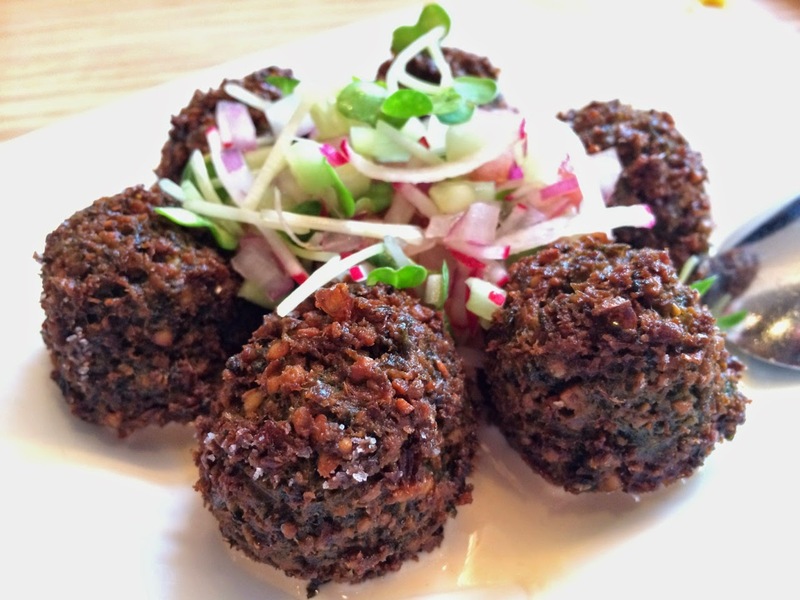 Falafel is served bite-size and arrives garnished with tahini sauce and a finely chopped radishes, red onion and micro greens. Chris compared them to southern Hush Puppies. Leaving our vegan eater by the wayside, Chris and I sampled a couple of meaty dishes. 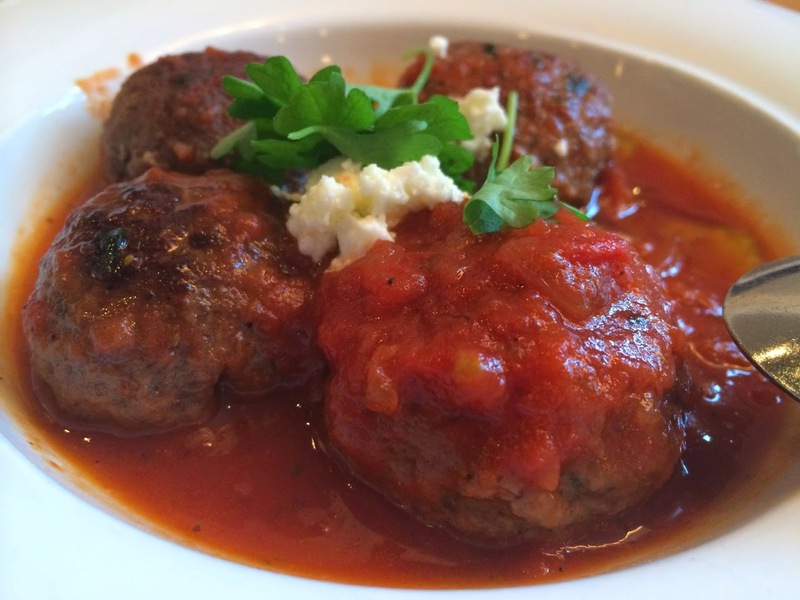 Tender beef and lamb meatballs seasoned with cinnamon and allspice and blanketed with tomato sauce were satisfying. 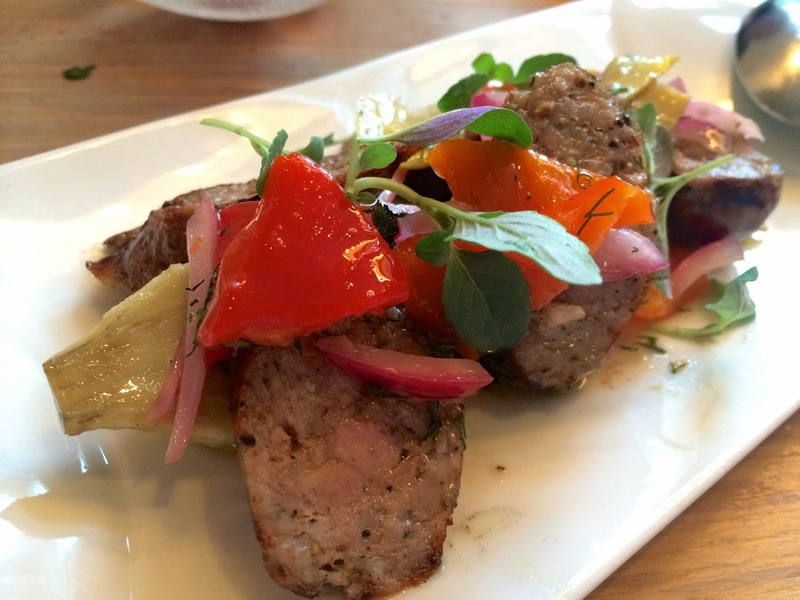 Even better was the grilled Greek pork sausages served with roasted peppers and marinated artichoke hearts. Besides the food, one of the biggest draws of Zaytinya is the space. In contrast to arty, colorful Jaleo, Zaytinya is minimal white walls and floor-to-ceiling plate-glass windows. It's a sophisticated choice that makes Zaytinya feel the most upscale of this trio of Andrés' Penn Quarter restaurants. But it's definitely a casual place with an inviting bar and one of downtown's best outdoor patios. 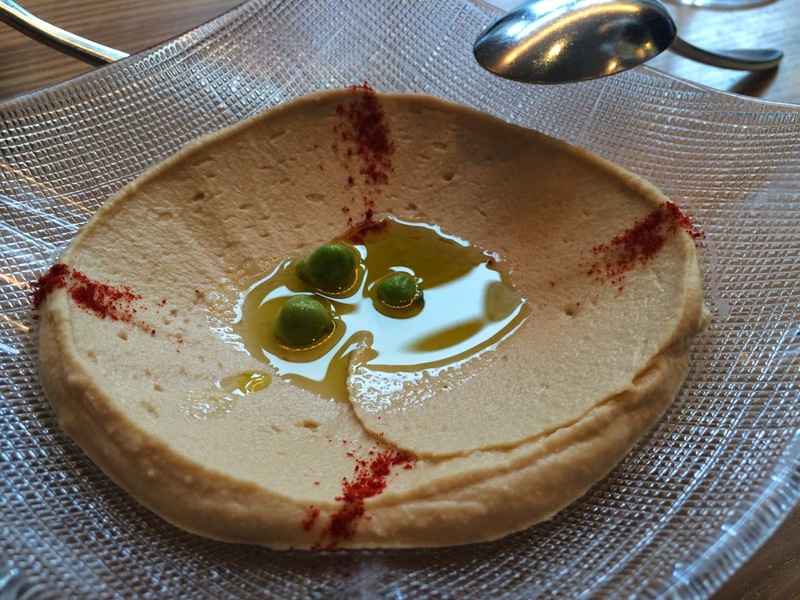 If I were to say that Zaytinya is my least favorite José Andrés small-plate restaurant, it is by no means a distant third. The menus of Oyamel and Jaleo strike me as more inventive, although it's possible they just play better to my personal tastes. Nonetheless, I would definitely have dinner at Zaytinya again and am glad I finally got the chance to do so. Having dined in Jaleo, Oyamel and Zaytinya within the last month, I'd definitely excited for later this year when this trio becomes a quartet with the opening of China Chilcano, Andrés foray into Chinese-Peruvian fusion. 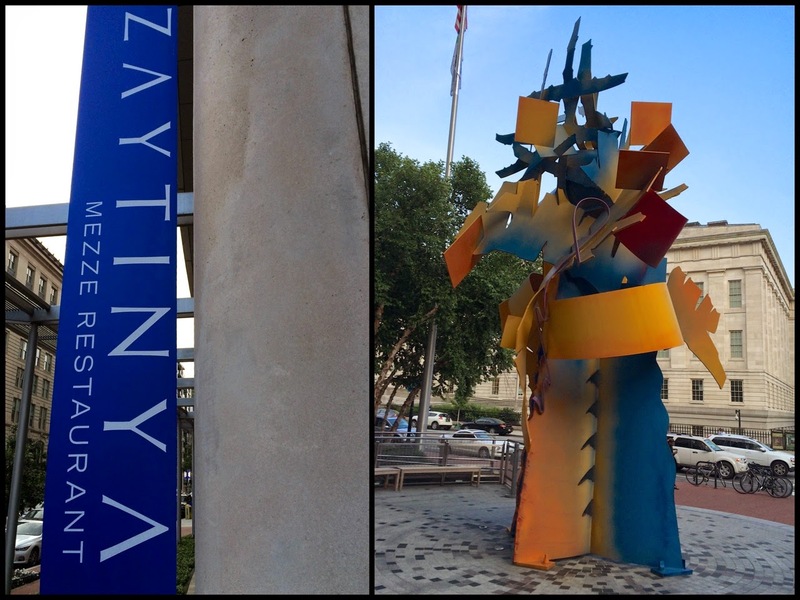 Zaytinya, 701 9th Street NW (at G Street), Washington, D.C. (Penn Quarter). (202) 638-0800. Reservations: Open Table.